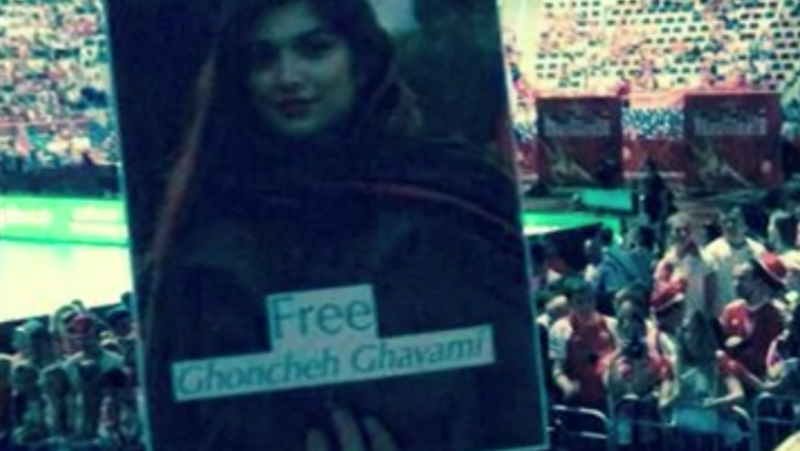 Ghoncheh Ghavami is imprisoned solely for her peaceful activities to end discrimination against women in Iran. She is a prisoner of conscience, punished for simply calling for equality. In 2012 Iran’s government stopped women from going to live volleyball matches. Women had been shut out from stadium football games in Iran since 1979 – and now they were prevented from watching volleyball too. 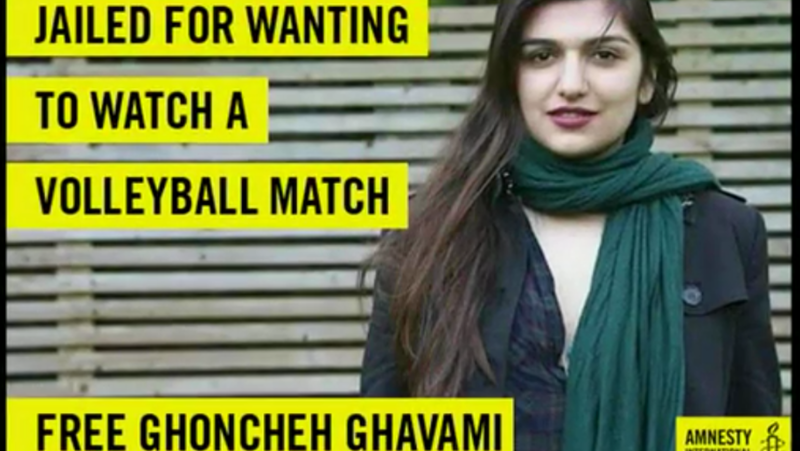 British-Iranian woman Ghoncheh Ghavami has been sentenced to a year in prison in Iran, just for asking for women to be able to go to volleyball matches. On 2 November, Iranian courts found her guilty of for ‘spreading propaganda against the system’ after she attended a peaceful protest calling for equality outside a volleyball stadium in June this year. Ghoncheh is imprisoned solely for her peaceful activities to end discrimination against women in Iran. She is a prisoner of conscience, punished for simply calling for equality. Iran must release her immediately. It was 20 June. Inside the Azadi Stadium in Tehran, Iran were playing Italy in the 2014 International Federation of Volleyball World League games. The crowd watching had one thing in common: they were all male. 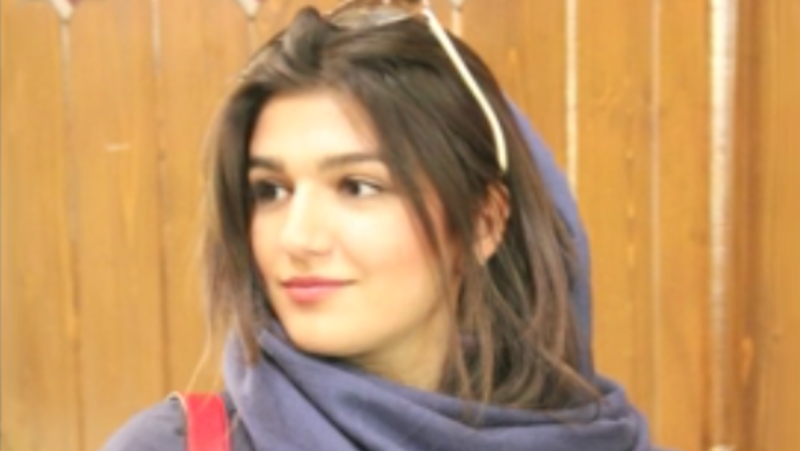 Ghoncheh Ghavami, a 25-year-old British-Iranian woman, was outside. She had joined a group of people peacefully asking that women were allowed in to watch the match too. Police responded to the demonstration by beating and arresting several protestors – including Ghoncheh who was beaten for peacefully protesting. She told her friend that police slapped her; her back and arms were bruised from being dragged along the ground. Police detained Ghoncheh and other protestors for several hours before releasing them, after the protestors apparently surrendered their identification documents and signed pledges saying they wouldn’t take part in similar protests again. Ten days later, Ghoncheh returned to the detention centre to collect her confiscated mobile phone. She was immediately re-arrested. Plainclothes government agents took Ghoncheh to her house to confiscate her laptop and books, before handing her over to Section 2A of Evin Prison, a notorious Tehran jail. On 1 October Ghoncheh went on ‘wet’ hunger strike – refusing all food, but taking liquid – for 14 days, in protest at the conditions of her detention. She ended the hunger strike on 14 October. Her mother says that Ghoncheh is visibly distressed and much thinner than usual. Ghoncheh wasn’t allowed to see her family at all for the first 50 days of her detention, while she was in solitary confinement. Ghoncheh was prevented from speaking with her lawyer until two days before her trial – and over 100 days into her detention. It appears that Iranian authorities tried to issue her with a lawyer employed by intelligence bodies: Ghoncheh said that a stranger came into her prison cell on 1 October, introduced himself as a lawyer and asked her to dismiss her current lawyer and use this stranger in his place. After she rejected his request, Ghoncheh says the man, who is believed to be affiliated with the Iranian intelligence bodies, threatened that new security-related charges will be brought against her. The Office of the Prosecutor in Tehran has referred Ghoncheh to the Revolutionary Court in Tehran for “spreading propaganda against the system”. This is not an internationally recognisable criminal offence. Ghoncheh has been kept in solitary confinement for much of the time since her rearrest in June. She has said that during her prolonged solitary confinement, interrogators put her under psychological pressure, threatening to move her to Gharchak Prison where serious criminals are held in dismal conditions. They told her she ‘would not walk out of prison alive’. Government officials say they are stopping women from going to stadium matches for their own benefit, as they need protection from the lewd behaviour of male fans. The International Volleyball Federation (FIVB) has apparently written to the Iranian president over Ghoncheh’s detention. ‘In accordance with the Olympic Charter, the FIVB is committed to inclusivity and the right of women to participate in sport on an equal basis. Ce contenu a été publié dans HumanRights, Iran, IranElection par AmisIran. Mettez-le en favori avec son permalien.